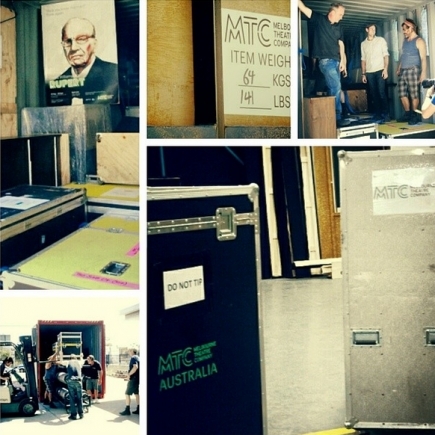 Over the past two-and-a-bit years, the MTC team has been on quite a journey. On New Year’s Eve 2011/2012, Brett Sheehy met with David Williamson to discuss the possibility of writing a new play for MTC. 17 months ago that play, Rupert, was announced as part of our 2013 Season. 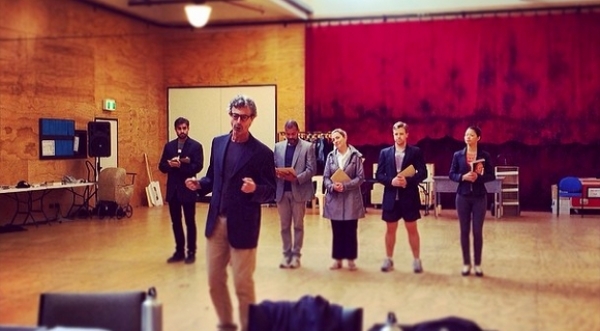 Seven months ago, we revealed the cast, and began rehearsals. 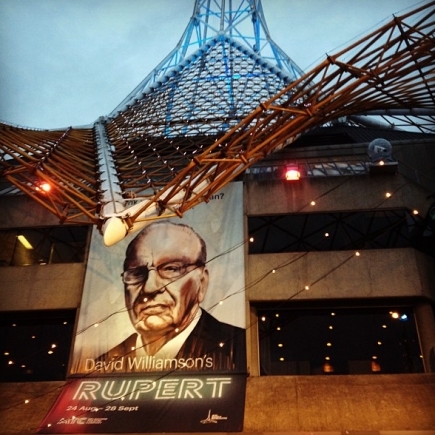 With each new development in the Murdoch saga, the script evolved – between the play announcement in August 2012 and the World Premiere at Arts Centre Melbourne in August 2013, we went through 50 drafts of the script. But the cast and creative team handled the changes with aplomb, and the production played to packed houses for four weeks last year, before closing in September. But we weren’t finished. Six weeks ago, we carefully packed the set and props into a shipping container and set them upon the high seas. Two weeks ago a troupe of cast members, creatives, MTC staff and crew arrived at the US Consulate in Melbourne and secured their visas. On Monday, the Rupert team returned to MTC HQ for a final week of rehearsals (kicked off by the traditional MTC morning tea, of course). Yesterday, our shipping container arrived at the Port of Baltimore. Today, it is being unloaded. 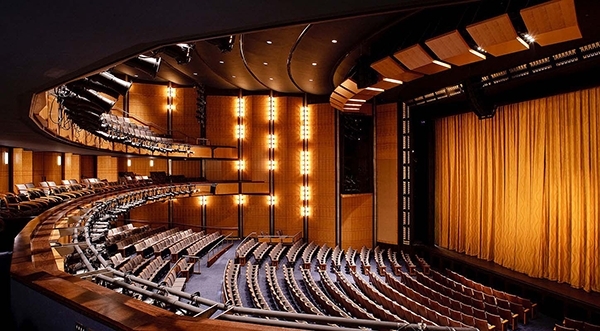 Next week, our team board a plane for Washington D.C. And two weeks from today, MTC presents its first international performance in more than 30 years, when Rupert opens at the World Stages International Theater Festival in the Eisenhower Theater at the John F. Kennedy Center for the Performing Arts in Washington DC. From an idea, to the page; from rehearsals, to the stage; from the announcement of a tour, to where we are today – it’s been an incredible journey. Are we excited? You bet we are! And we couldn’t be prouder of the brilliant team who put it all together. From all of us here at HQ who wish we could join the team on tour – CHOOKAS! We’ll be with you in spirit.